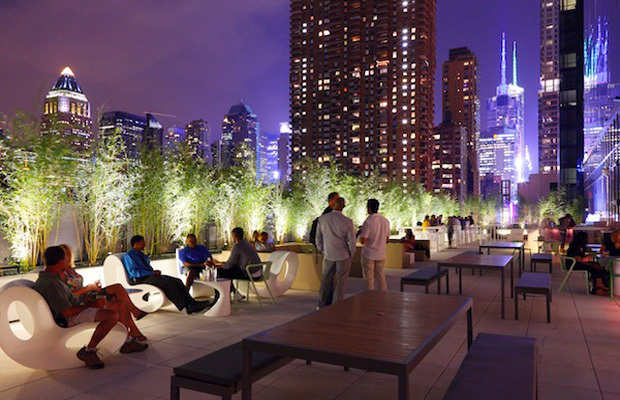 YOTEL has been one of the biggest attractions in New York City since opening in 2011. 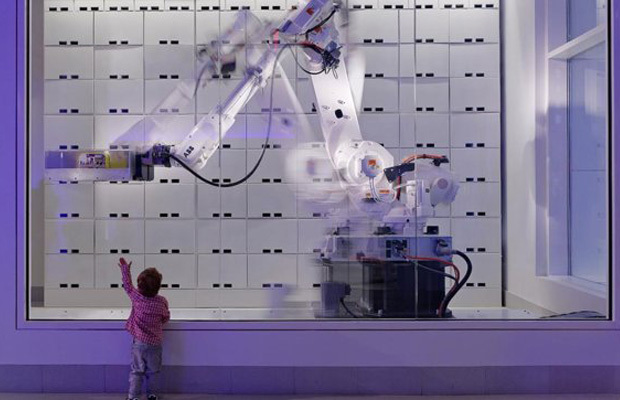 Outfitted with a technological futuristic design, the hotel sets itself apart from many of its competitors by offering a unique and hi-tech experience for tourists from its eye-catching purple lighting to its robotic luggage handler. Located at the heart of Manhattan—Times Square to be exact—the establishment remains one of the biggest attractions in the city that never sleeps, while garnering mass appeal across the globe at its two other hot spots: Amsterdam and the United Kingdom. But since its introduction, everyone’s developed a curiosity over the ultramodern hotel’s conception. So what’s the true vision behind YOTEL? Why has it embraced such a distinct hospitality approach? And why go the high-tech route? CEO Gerard Greene took some time out of his hectic schedule to discuss his creation in full. YC: Does the name YOTEL mean anything? GG: YOTEL was partially founded by Simon Woodroffe, the founder of all things YO! He liked the phrase “YO” as a form of greeting – he had an employee who often greeted people this way, a very un-British style, which he thought captured the informal and casual nature of the next generation of consumers and so he began what has become a series of YO businesses: including YO! Sushi, the restaurant group. Culminating in the launch of the YOTEL brand. YC: Where did the idea for YOTEL come from? GG: YOTEL was inspired by airline travel. Once when Simon was upgraded unexpectedly on a British Airways flight he looked around, realized how you could use amazing design in a small space. and still keep it luxurious, smartly designed and functional. That’s why YOTEL has modular, modern design—everything you need is readily available with the push of a button and hidden away when you don’t need it. The entire hotel employs economy of space without sacrificing on comfort and convenience—exactly the same way a first class airline cabin does. YC: Why is the hotel in the color purple? GG: Honestly, partly because we just liked it, but also because purple is made up of the calmness of blue and the energy of red, suiting the brand perfectly, we had a great first reaction to the use of purple even in the original prototype design. Guests do feel that it has a calming influence, especially in the airports where they want to feel like they are walking into their own private oasis of calm in amongst the airport hubbub, Other have likened it to a zen-like “Star Trek” experience. YC: Can you talk about the Asian influence on the design of YOTEL? GG: I love the transforming nature of Japanese/Asian design; they utilize their spaces in many different ways making them flexible, but still practical at the same time. We have designed all our public spaces to fit that theme, our restaurant ‘Dohyo’ (named after a Japanese sumo wrestling ring – and is exactly the same size) has hydraulic moving tables so that after a communal dining experience it can be transformed into a performance area or art space. Our cabin design combines the use of contemporary materials with natural materials such as oak and the bed converts from a couch so that you can sit and watch TV and create more space for lounging or working. 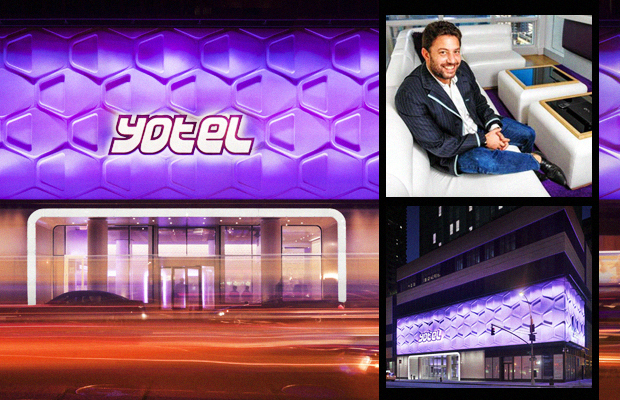 The overall YOTEL experience is sleek, modern, convenient, but also irreverent and fun. YC: YOTEL is in three countries so far. Are there any plans to expand? GG: Yes, we have plans to expand both in the United States and Europe, but also beyond that to Asia and the Middle East with both airport and city hotels. YC: What has the reaction been from the hotel industry about YOTEL’s uniqueness and the customers? GG: I guess that it’s always nice to receive acknowledgement for the brand and whilst we have received lots of awards recognizing the design and overall experience at YOTEL. I’m most pleased that our customers love the experience and are voting with their feet, that’s the biggest accolade you can get. I spent years staying in boring and expensive hotels and wanted to do something about it; it’s a pleasure to be able to say that YOTEL genuinely turned the hotel industry on its head. YC: There seems to be a technological bent to YOTEL. Example: the luggage-carrying robot. Why? GG: Our guests employ technology in everything they do. Generation X and now Y, which is the fastest growing consumer group in the world, are used to getting what they need at the push of a button, having choices about how they manage their time and being connected at all times. We have airline style self-service check-in/out kiosks, free super-fast free WiFi throughout the hotel and lots of connectivity and power points in the public spaces and the guest cabins. YOBOT, our luggage robot, was really just for fun. Yes, he is legitimately there to store luggage, but we also knew that our guests would be entertained watching him work. And, thanks to a glass window facing 10th Avenue, he is also fastly becoming a bit of a tourist attraction in his own right! YC: Are there going to be plans to increase technology in the hotel? GG: If it’s simple, cost effective, and user-friendly, we have learnt through a lot of experience at our airport hotels that technology needs to be easy to use and it needs to enhance the customer journey. We have a small team of crewmembers who work in all different area of the hotels that contribute to a CANI (constant and never ending innovation) session once a month to evaluate ideas and propose “what’s next?” for YOTEL. YC: Why did YOTEL choose Times Square to open its first New York City location? GG: If we were going to open our first city center hotel in New York, we thought that, true to our brand values, it should be in the middle of everything: in the center of the most activity. Times Square and the Hell’s Kitchen neighborhood are thriving, and constantly developing areas of New York City. The areas’ vitality and constant energy provide the perfect backdrop for YOTEL. Also, we are right near many of the sights and attractions that our visitors are coming to New York to see and do in the first place, including the Theater District, which is a huge draw for tourists to the city. You can also get to the Jacob Javits Center in just 5 minutes: New York’s main destination for premier consumer and trade shows. It is literally steps from the hotel entrance. LC: What would you say to people who are interested to come to YOTEL? GG: We pride ourselves on being very democratic, appealing to all types of travelers at YOTEL, because we are all about being affordable, but at the same time we offer convenience and comfort with smartly designed spaces for guests to simply relax, sleep, connect refresh or work. Combined with a bit of fun, that all makes it a great place to stay whether on leisure or business.